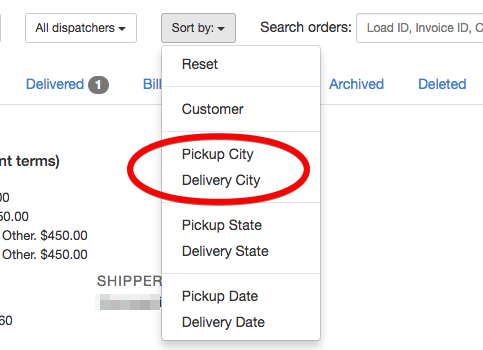 In the dashboard main order screen, next to the "All drivers" sort option, the "Sort by" drop down menu allows the dashboard user to sort all current orders throughout the entire order life cycle by Customer, Pickup City, Delivery City, Pickup State, Delivery State, Pickup Date, or Delivery Date. This sort function can also be used in conjunction with the "All drivers" sort option, allowing the user to refine a search and view specific orders as required and in a specific way. In addition, a data field will appear on the right side of the screen containing increments relevant to the sort chosen, with circles containing the number of orders within each category of the sort result. This sort can also be Reset to return back to the previous default view mode.